Piedmont hosts many festivals throughout the year to promote the various seasonal delicacies; from the famous Asparagus Festival in the spring, to the truffle and slow-food fairs of the autumn. In addition to the big annual foodie festivals, which attract visitors from all over the world, there are also many weekly markets which are worth a visit. But it is not just food and wine on the agenda, Piedmont is also big in the arts and culture world. In the summer, the villages of the Langhe and Roero offer world-class music for visitors, most notably the Alba Music Festival, Monforte Jazz Festival and the Collisioni Festival (which attracts international headline bands). Or, for those who enjoy getting an overall flavour for a place, then the Douja D’Or festival is an excellent celebration of all things food, wine, arts and culture. We keep an up-to-date calendar of all events taking place in Piedmont throughout the year, which helps us to plan your trip accordingly. Based on our understanding of what you are looking for out of your time away, we can then recommend the most suitable places for you to visit. We aren’t afraid to tell you when not to go – as this is sometimes just as important when planning these things! In addition to the local markets and big annual events, we will also provide you with detailed information on our favourite eateries (which we’ve personally tried & tested) before you travel. From the 3-Star Michelin experiences, to the best family-run trattorias in town – we have done our research! Technically there is never not a good time to sit back and enjoy a wonderful glass of Barolo. 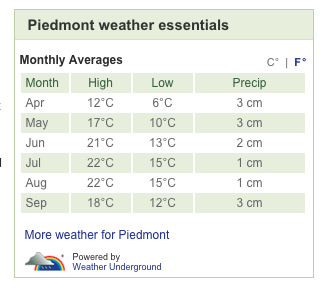 However, between December and March Piedmont becomes rather a sleepy place. Many of the hotels and restaurants close down completely during these colder months and use the time for refurbishments. Most are ready to open their doors to the public in time for the Easter holidays, as the weather starts to warm up once more. If you’re looking for an Italian winter getaway then don’t despair, there are some cosy options and the region also offers skiing in the foothills of the Alps. Rather uncharacteristically of Italy’s general travel season, Piedmont’s ‘busiest’ time of year for tourism is the Autumn (September – November). This is because the famous white truffle is harvested in September/October, in anticipation of the annual International White Truffle market (a foodie festival which celebrates this expensive funghi), which takes places from mid-October until mid-November in the medieval town of Alba. This is one of the most popular times to visit Piedmont, so we would advise planning way in advance if you’re set on getting your hands on this ‘white gold’ (ideally 9 months or more). In addition to the white truffle harvest, the Langhe landscape is transformed into a warm patchwork of oranges, browns and reds. It gives the likes of Connecticut in the USA a run for its money in the autumnal beauty stakes! A word of warning though, given the popularity of this period, hotels are more expensive, and places (including restaurants) will get booked up extremely early. Book in advance to avoid disappointment and we will make restaurant reservations on your behalf. It really depends on your reasons for visiting the region, but if the white truffle is not one of them, then we would recommend your visit earlier in the year for better value for money and more choice. Personally, we love the spring in Piedmont, as there are fewer crowds and the landscape is just coming into bloom! The countryside is rife with beauty at this time of year and the temperatures should start creeping up into the early twenties. Having said this, the weather is slightly less predictable in this Northern region of Italy than further South, which is one of the reasons it gets less tourists. This has its advantages, but also means that you may encounter some rain. 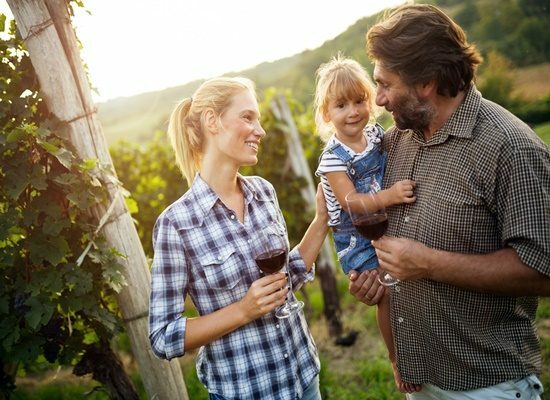 Despite this, the spring is also a lovely time to visit a quieter vineyard, which will have just re-opened after their winter block out period, so you’ll be sure to get a little extra attention. It is also worth noting that there is the Vinum annual wine festival in May, which showcases the region’s best produce. For sportier types, the spring weather is ideal for cycling, hiking or exploring, as you will enjoy crisp, bright and mild days – also perfect for sightseeing. 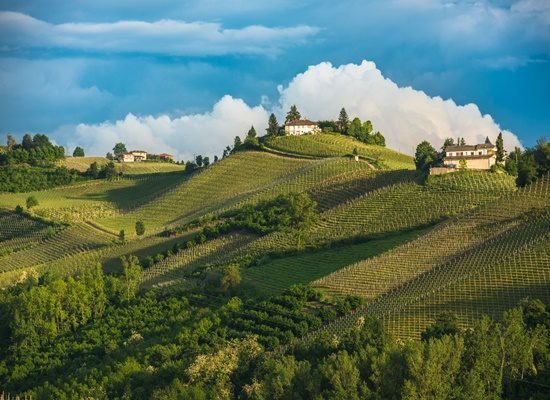 The summer months are undoubtedly one of the best times to visit Piedmont. The weather is at its warmest and sunshine should be on the cards, making it an ideal time to visit for some wine and relaxation. It is also a great option for a family holiday during the school break. It can get very hot though, which makes the vineyards dry and dusty. So, make sure you pack appropriate walking shoes, loose fitting clothing, sun-cream and prepare to stay hydrated! Life in Piedmont turns pretty quiet during the month of August, which is when the majority of locals escape to the coast for their summer holidays (which coincides with a big national holiday). This does mean less people about, but some things will be closed. As long as you have someone who knows where you can go and what you can see, it shouldn’t affect your experience. Whenever you decide to go, you can be sure it’s worth the effort for the views alone! If thinking about visiting during the spring, just watch out for the dates of Nebbiolo Prima, an annual trade wine event, as boutique hotels get booked out with suppliers and journalists attending. The summer months benefit from warmer weather, but with this comes those pesky little mosquitos! So just make sure you come prepared with lots of insect repellent. If you’re looking to stock up on white truffles at the annual festival, then be warned that these are some of the most expensive ingredients in the world and can set you back thousands of £££’s! The Lange is best accessed by car, but be prepared for journeys to take longer than expected as the roads are hilly and winding.